It’s hard to believe that prior to her win at the 2018 Roxy Pro Gold Coast to kickstart an amazing season, six years passed between CT victories for California’s Lakey Peterson. Peterson currently sits second on the 2018 World Championship Tour, and her fitness regimen has played a huge role in her success. It’s second to none. In fact, Peterson has held a top ten spot in the women’s rankings every year since her 2012 Championship Tour debut. We caught up with Peterson to talk all things nutrition, health, and wellness. Lakey’s circuit routines in the gym will motivate anyone hoping to step up their game, and in the past she has also shared her a few techniques (along with healthy recipes and inspiring messages) on her healthy lifestyle website, thesaltycoconut.com. A few things she gave insight on which have clearly paid off for her include Foundation Training, which enables crucial strengthening of muscles in your lower back. Many of the exercises can be done while brushing your teeth or doing the dishes, and the results are better balance and stronger, more fluid motion during athletic activities. Also on the Salty Coconut, Lakey breaks down the perfect 30-minute exercise routine for people who travel a lot and five simple tips to prep for any sporting competition. No muss, no fuss, that’s the California way. Are you hungry? No? Well, you’re about to be after hearing Lakey’s tasty meal prep before heats. Choosing the hearty route, Lakey fuels her body for action the night before and the morning of her heats with that ideal balance of beneficial fats, protein, and carbs. Anyone can get a little down, especially when trying to achieve extreme physical feats at an elite level. But following her ankle injury in 2016, Lakey realized that good health can be taken in a flash. Since then, she’s embraced an unwavering gratitude for each injury-free day that keeps her mindset sunny and positive, which brings about positive results. Wanna live like Lakey? Well, don’t. Just do you, boo. This champion finds her perfect health balance inside herself, not from outside sources. Listen to what your body does and does not want, and don’t force yourself into a box that isn’t perfectly shaped for y-o-u. 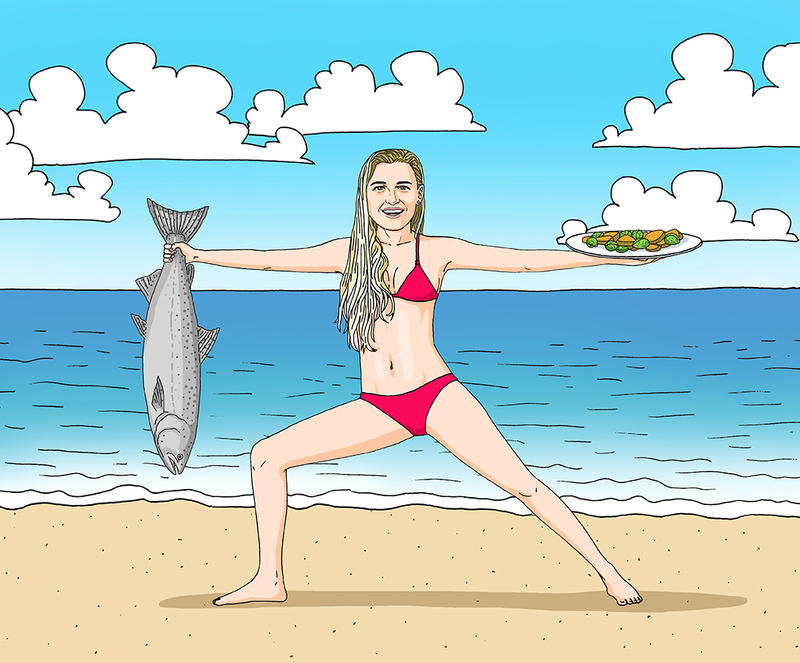 Want more nutrition tips from badasses in surf and outdoors? Check out Julian Wilson’s installment of Champs on Health here.